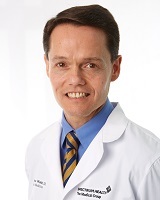 Dr. Walsh graduated from Augustana College with honors in 1990 with a Bachelors in Biology. He attended the Chicago School of Osteopathic Medicine, graduating in 1994, before completing his residency at the Naval Hospital in Camp Pendleton, California. Before coming to Saint Thomas, Dr. Walsh worked as a Battalion Surgeon in the Marine Corps and then as a Staff Physician at the Naval Hospital in Twenty-Nine Palms, California. He then moved to Spectrum Health Medical Group in Kentwood, Michigan, where he practiced family medicine for 15 years. Dr. Walsh is board certified in Family Medicine and is a member of the American Academy of Family Physicians and the Michigan Academy of Family Physicians.